Plasti Dip Multi-Purpose Flexible Rubber Coating. 311 gram Aerosol Cans. Customers are using this product to coat their wheel rims and usually purchase between 4-6 cans. The average usage to coat wheel rims is 1 can per rim. We recommend 5-7 thins coats of Plasti Dip to get good coverage, this will make it easier to peel off the Plasti Dip if required. You can download the Technical Data Sheet below for technical information and usage instructions. The car in the picture has it's wheels coated with the Matt Black Plasti Dip Spray. Silver and Gold Metalizer - Gives a Silver or Gold Metallic finish to your matt Plasti Dip. Surfaces which are non-absorbent such as metals should be primed using our recommended Primers which are available in Clear colour. Sizes: .946 litres and 3.78 litres. For coverage and other technical information, please refer to our Technical and Manufacturer's Safety Data Sheets. 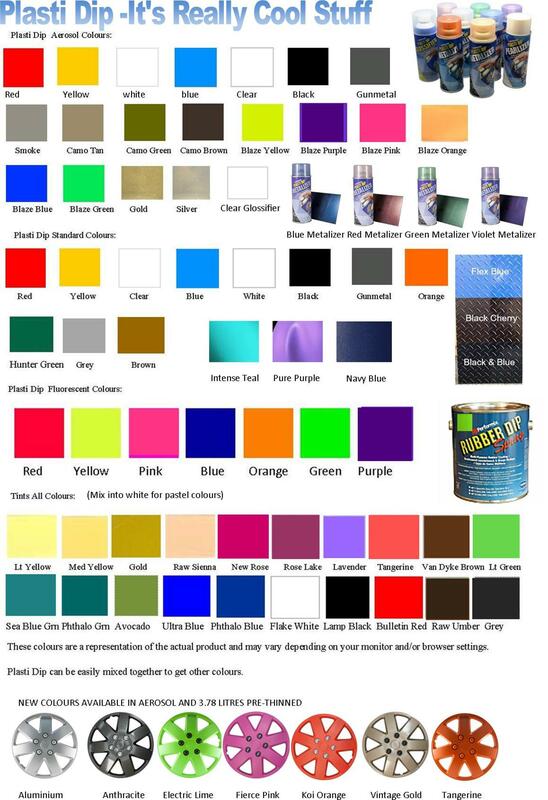 Plasti Dip is available in 214ml, 429ml, 651ml containers and in 311 gram aerosol cans. Larger Sizes: 3.78 litre and 18.9 litre and (189 litre to order only) in standard Plasti Dip Colours or can be tinted if required. UV, Fluorescent and Glow in the Dark Formulas are also available. 651 ml. Plasti Dip Clear! This new package utilizes the same redesigned container as the Create Your Colour Kit and can be used on its own as a clear dip coating or can be tinted with our Tints-All colourants, or you can use the Create your Colour Kit. Plasti Dip Primer is now availabble in 311 gram Aerosol Can.